There are a ton of injuries to consider for the nine games on the NBA slate for tonight. Some of them you already know about, but there are several teams on the second of back-to-backs with a lot of question marks. We’ll give you an idea on who to keep an eye on as these players’ replacements and if you should consider them. Let’s dive in. Orlando – Luke Ridnour is questionable after missing yesterday’s game with a personal matter. It’s pretty irrelevant if he plays though. The Magic are significant underdogs, and the Wizards are great against PGs. Plus, no one specifically gobbled up Ridnour’s minutes last night. It was collective. Washington – Bradley Beal went through shootaround, but his status is unknown. Unfortunately, when he missed the Brooklyn game, the Wizards blew out the Nets, so it’s difficult to tell who will see the biggest bump in minutes. Otto Porter Jr got the start, but Porter, Rasual Butler and Garrett Temple all racked up between 21 and 24 minutes. The last time Beal missed a game was his early-season injury, and his most recent one of that was against Orlando. Temple started, but again, the three guards all played similar minutes. It’s probably best to just avoid this situation. San Antonio – The Spurs are finally healthy, but they are on the second of a back-to-back. Luckily, San Antonio tips when lineups lock. Just for safety measures, check in and make sure the veterans are not getting the night off. Indiana – Lavoy Allen is still out, but Ian Mahinmi is now questionable. In the games without the big men, Hibbert has received 36, 30 and 40 minutes. Should Mahinmi miss another game, it could easily be another 35-plus minutes for Hibbert. The Spurs are average against big men, and Hibbert is somewhat risky. Consider him an occasional GPP play at best. Golden State – None. Tee off Warriors. Philadelphia – The obvious absences for Tony Wroten, Andrei Kirilenko, Jason Richardson and Joel Embiid. The twist is a questionable Michael Carter-Williams. The 76ers starting lineup is obviously a question mark every night, but Tim Frazier is the guy who has started in Carter-Williams’ place. Frazier hasn’t been looking to score much, which is somewhat odd considering he was such a terrific scorer in college. Frazier has had a limited role, but he’s minimum salary and should get 35-plus minutes even if it’s a blowout. New York – None. Seriously. Miami – Besides the obvious Josh McRoberts absence, we are looking at three guys with a questionable status – Dwyane Wade, Hassan Whiteside and Shawne Williams. Because the Heat have so many guys that play multiple positions and are trying some different starting lineups, this is a tough one to assess. The likely scenarios – Shabazz Napier will start at point guard and Mario Chalmers will slide over to the 2 if Wade can’t go. Chris Andersen will start, but Justin Hamilton will pick up most of Hassan Whiteside’s minutes. Chalmers usually gets a decent increase in usage percentage without Wade and would be a decent play. Napier and Hamilton are risky. 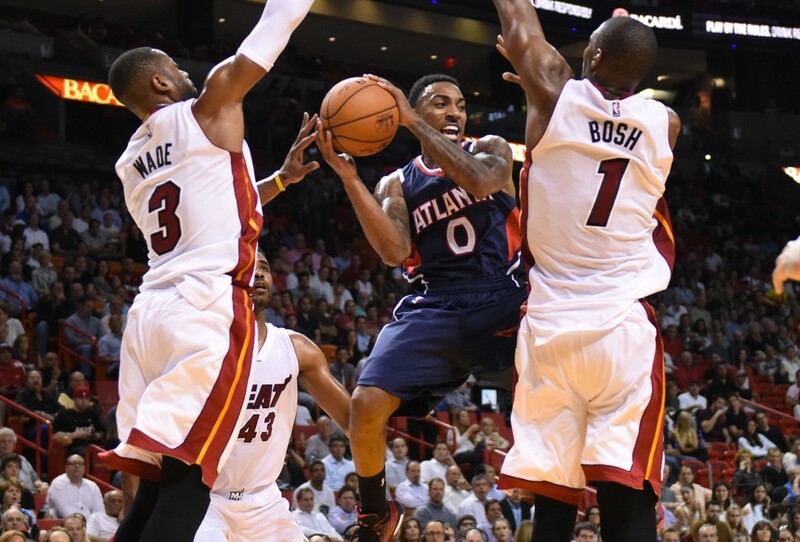 Atlanta – Jeff Teague rolled his ankle last night against Memphis. His status for tonight is questionable. Dennis Schroder has been getting the start when Teague misses time. Provided there’s no blowout, he’s been logging over 30 minutes. Against a weak Minnesota team (despite playing well as of late), Schroder is definitely in play in all formats if Teague is out. Minnesota – Not only is Ricky Rubio probable to return, so is Shabazz Muhammad. Since Muhammad’s role is difficult to predict, Rubio’s minutes will only be in the 20s most likely and that it’s against the Hawks, it’s best to avoid the T-Wolves all together. Utah – While we know Alec Burks, Rodney Hood and Carrick Felix are all out, Joe Ingles still is as well. So, it should be another start for Elijah Millsap. He played 36 minutes last gameand got 21.9 FPTS. For someone who is near minimum salary and having a great matchup against a depleted Pelicans team, this is a great opportunity to punt. New Orleans – My goodness. Not only is Anthony Davis out, Ryan Anderson is also doubtful. It’s really tough to say how New Orleans will go about this since Jrue Holiday is still out as well. The Pelicans could go big and start – Tyreke Evans, Eric Gordon, Dante Cunningham, Alexis Ajinca and Omer Asik. They could go small with Jimmer Fredette, Gordon, Evans, Cunningham and Asik. They could go somewhere in the middle with Evans, Gordon, Quincy Pondexter, Cunningham and Asik. Here’s what we do know though – Evans and Gordon will have the ball in their hands a lot, and Asik’s numbers should be outstanding without the other big men. Brooklyn – Deron Williams missed shootaround and is a game-time decision with an illness. Should Williams not go, this is a big bump for Jarrett Jack. We’ve seen this episode before. Milwaukee – Outside of all the normal Bucks injuries, Zaza Pachulia is probable and Kenyon Martin is questionable. Also, in case you missed it, Ersan Illyasova is back as well. This makes the Milwaukee front-court picture a bit unclear. If Pachulia plays, how many minutes? Does Martin even play if he’s healthy? Is Jared Dudley irrelevant now? Do Giannis Anteokounmpo or Khris Middleton lose some production out of this somehow? The short answer is – it’s all risky, because Jason Kidd will constantly tinker, not to mention this game is against his former team. There is one thing for sure though. Brandon Knight has been a stud, and the Nets have been average at defending PGs with or without Williams. LA Clippers – In case you were absent from the sports world yesterday, Blake Griffin is out for the next four-to-six weeks. With Glen Davis and J.J. Redick doubtful tonight as well, we are likely looking at another starting five of Chris Paul, Austin Rivers, Matt Barnes, Spencer Hawes and DeAndre Jordan. Truthfully, this is a bump for everyone in the starting five, and Jamal Crawford gets a bump as well. Paul will take more of the offensive load, Rivers is getting 25-to-30 minutes, Barnes will look to score a bit more, Hawes received 35 minutes yesterday, Jordan should have a slight increase in rebounding and Crawford racked up 34 minutes off the bench. The biggest increase is Hawes. It’s unfortunate he is listed as a center on FanDuel, but his minimum salary is essentially impossible to pass up for those minutes. Plus, the Mavericks are a much better matchup for big men than the Thunder. Dallas – Just the usual Rondo absence. Oklahoma City – No Steven Adams, so it’ll likely be Kendrick Perkins starting at center. This gives a slight bump to Serge Ibaka, who typically crushes the Nuggets in this great matchup for big men. If Anthony Morrow is still out, Dion Waiters will probably get a slight increase but not enough to play him with Russell Westbrook and Kevin Durant playing. Denver – Jameer Nelson and Erick Green are questionable for the Nuggets. Ty Lawson will get 35-plus minutes, but if both guards are out, he’ll play over 40. Anything else with the Nuggets is always a mystery with Brian Shaw and getting effort out of his guys.